Details relating to the Belgian Commemorative of 2013. The coin commemorates the 100th anniversary of the founding of the Royal Meteorological Institute. The duties of the Royal Meteorological Institute, include amongst others, warning the authorities of any impending storms. For many years astronomy and meteorology were combined in a single institute, but in 1913 meteorology was established as a separate institute. A bit of history relating to the design. A competition was held for an appropriate design and a vote per internet held to determine the winner. The public wish was however not honoured but overridden and the current design decided on by “experts”. How unlike Brussels to ignore the wishes of the people!! That having been said, the design adopted is actually rather good. In the inner circle the number 100 is shown with the first zero representing a cloud from which rain and snow are falling. The second larger zero clearly represens the sun. The abbreviations within the first zero are for the institute in the Flemish (a language very similar to Dutch) and the French language. In the upper left quadrant of the inner circle a number of isobars are depicted. The year of issue, 2013, is shown at the top and the country identification “BE” at the bottom near six o’clock. Finally, the mint mark and the mark of the mint master (a cat) are to be seen at eight o’clock. 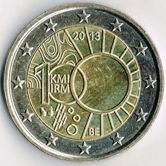 Return from Belgian Commemorative 2013 to euro coin collector.